The Traditional Tool aids in creating multiple maneuvers and combining them over the course of a single transition. 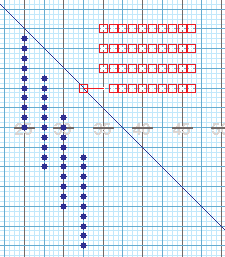 Since this tool is an Editing tool, performers must be selected, and your Yellow and Red Anchors on the Count Track must be spread for a transition. Click on the Traditional Tool on the Tool Palette to open the Traditional Tool Control Panel. Editing handles appear on each performer. Drag any performer to determine the initial marching direction for all for of the performers. As you drag an editing handle an action line will appear on the field. This action line designates the starting line for a Route (maneuver) to begin. As each performer crosses this line, the performer will begin following the Route. In this example, the performers are initially moving in the same direction as the leader (left). As they cross the action line, the performers begin the route. In this case the route is a simple LF (Left Flank). Routes are entered in the Route box by typing the code for the move followed by a number of steps. Each move is separate with a comma. The above example is a Left Flank (LF), then take 2 steps and make another Left Flank (LF), then continue marching to the end of the transition. This is a standard left Counter March. When entering the route in the Route text box, the description of the maneuver(s) will appear in the Description area. This will help you confirm that you are entering a correct route. Action Line Slope changes the slope of the starting line of the route. Typically the slope will be 0. 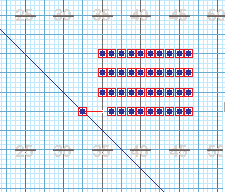 However you can set the line to a 45 degree slope which allows you to create column left and right formations. There are 7 different settings of slope available: no slope, 22.5, 45, 67.5, -67.5, -45, and -22.5 degrees. Any selection will influence the direction the column will turn. New creates a new traditional maneuver. Save will save your route as a traditional maneuver to be used again later. Copy will open and display a saved route. Delete will delete a saved route. Revert resets the handles to their initial position. Accept accepts the shape into the drill.